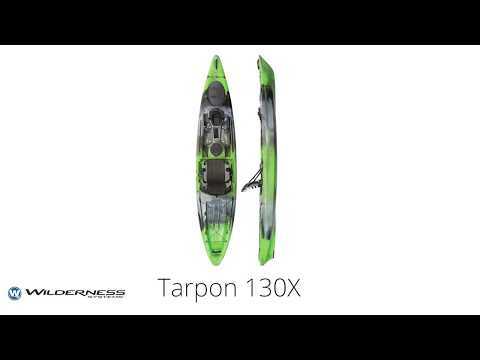 The Wilderness Systems Tarpon 130X is the Tarpon that anglers have been waiting for. It has the same sleek and speedy performance as the rest of the Tarpon series but has been upgraded with fishing specific features. The best upgrade is that it now includes the AirPro MAX Lite seat that can be adjusted fore and aft. It also includes the Flexpod OS for versatile use of electronics and an additional transducer scupper when propulsion systems are engaged in the Flex OS scupper. The Tarpon 130X still has the features we love about the original Tarpon series like the generous tankwell storage, large bow hatch, 4 SlideTrax accessory rails, mesh gear pockets, a day hatch, and bungee paddle leash. The Tarpon 130X is a performance-driven sit-on-top that is the perfect platform for kayak fishing. Discontinued model. Q: does the tarpon 130x come with a cup holder in cockpit area or is it a blank cover as seen in photo ? A: The cup holder will not come with this kayak. Q: The other day I stopped in the store to look at a future fishing kayak right now I'm in a Jackson skipper but I need more room I saw this kayak built in the store with led and rudder and a depth finder can you give me a price?